Come school holidays, we need to think about keeping the kids tummies full. Hungry children are grumpy, whiny children in this house, and I’m not a fan of whining. So on Saturday, I knew I needed to get some snacks organised to get us through the first few days. At this time of year the gardenis a little bare, with the exception of our trusty rhubarb plants. 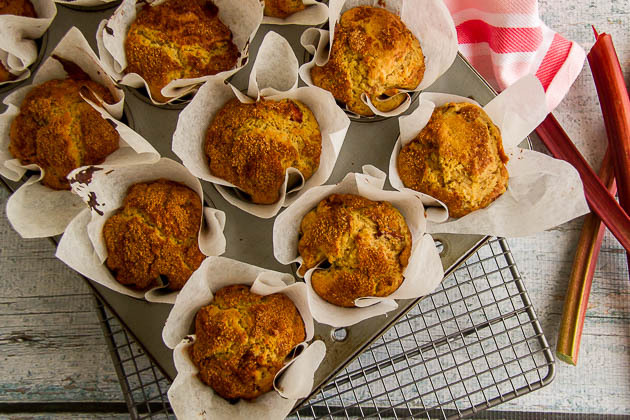 So I grabbed a few stalks of rhubarb and whipped up these muffins. 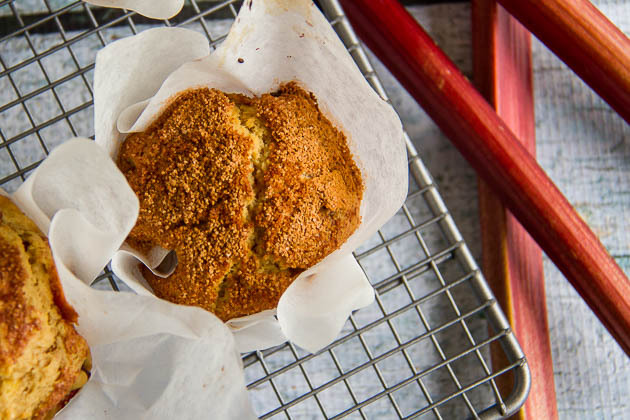 The cinnamon sugar topping is a beautifully sweet, crunchy contrast with the little tart pockets of rhubarb spread through the muffin. The kids hoovered the muffins up as soon as they were out of the oven and declared them delicious. Hunger was abated for at least a day… until I have to cook again. Place the flour, sugar, baking powder, cinnamon, and bicarb soda in a large bowl. Place the buttermilk, melted butter, vanilla and eggs into the bowl and mix with a wooden spoon until combined. Stir through the finely sliced rhubarb. Spoon the mixture into lined muffin tins. Mix the additional sugar and cinnamon together in a bowl and then sprinkle over the top of each muffin. If you don't have buttermilk, use ordinary milk with a teaspoon of vinegar added to it. Do you need to do extra cooking in the holidays? What are your favourite muffin flavours?